Buy 2 packs and get the 3rd pack FREE! 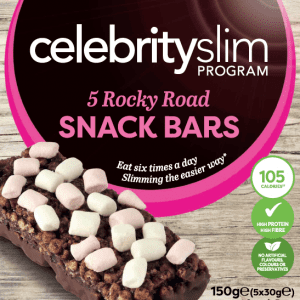 The Rocky Road is our favourite in the Celebrity Slim™ office! 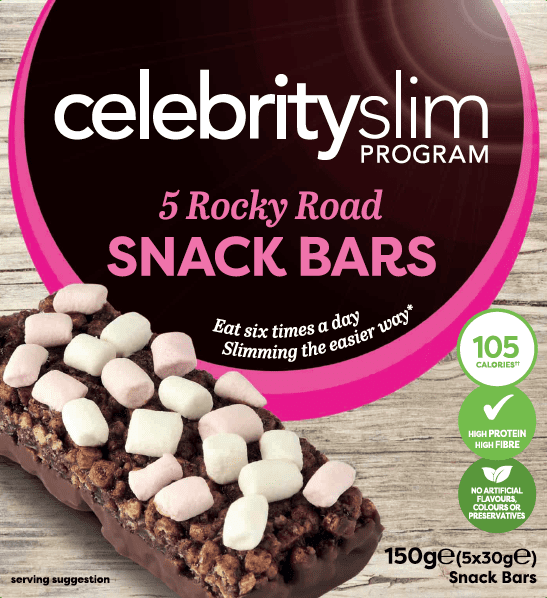 Topped with real marshmallows and dipped in milk chocolate the Rocky Road Snack Bar will satisfy the sweetest of tooth. 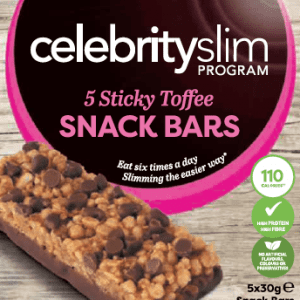 Soya Crisps (Soya Protein, Tapioca Starch, Salt), Oligofructose, Milk Chocolate with Sweetener (13.3%) (Maltitol, Cocoa Butter, Whole MilkPowder, Cocoa Mass, Emulsifier (Soya Lecithin), Flavours), Glucose Syrup, Marshmallows (5.0%) (Glucose-Fructose Syrup, Sugar, Gelatin, Maize Starch, Colourant (Beetroot Red), Flavour), Sugar, Rice Crisps (Rice Flour, Wheat Gluten, Sugar, Wheat Malt, Glucose, Salt), Corn Flakes (Corn, Sugar, Salt, Barley Malt), Skimmed Milk Powder, Humectant (Glycerol), Milk Protein, Shortcake (1.7%) (Wheat Flour, Vegetable Fat (Rapeseed, Palm Oil), Sugar, Salt, Sodium Bicarbonate, Ammonium Bicarbonate), Low Fat Cocoa, Sunflower Oil, Flavours, Cocoa Butter, Raspberry (0.4%), Whole Milk Powder, Cocoa Mass, Emulsifier (Soya Lecithin).